Banyan Day or the Knight Befoul'd, Thomas Cowley, 1779, British Museum. 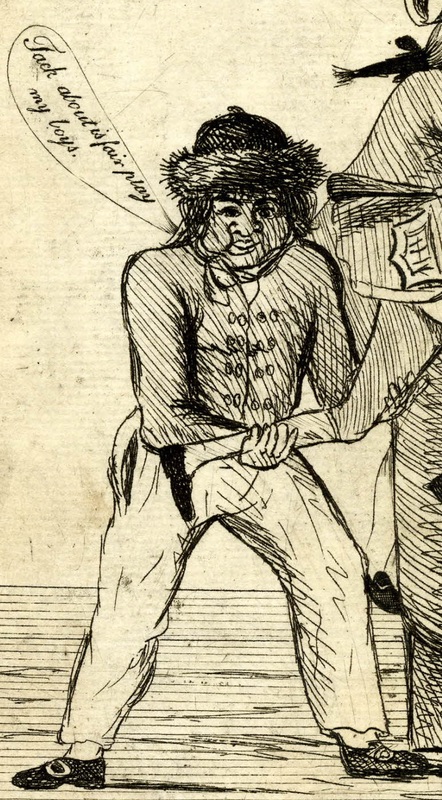 Cowley does not rank among the most skilled political cartoonists of the eighteenth century. His works are simplistic and often a bit awkward. 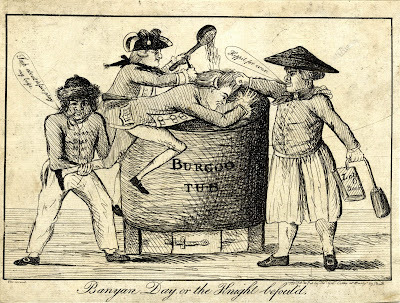 In this example, two sailors and an officer push a gentleman into a "Burgoo Tub. "That gentleman is probably Sir Hugh Palliser. He has been dressed up a bit with a French style wig to imply duplicity. 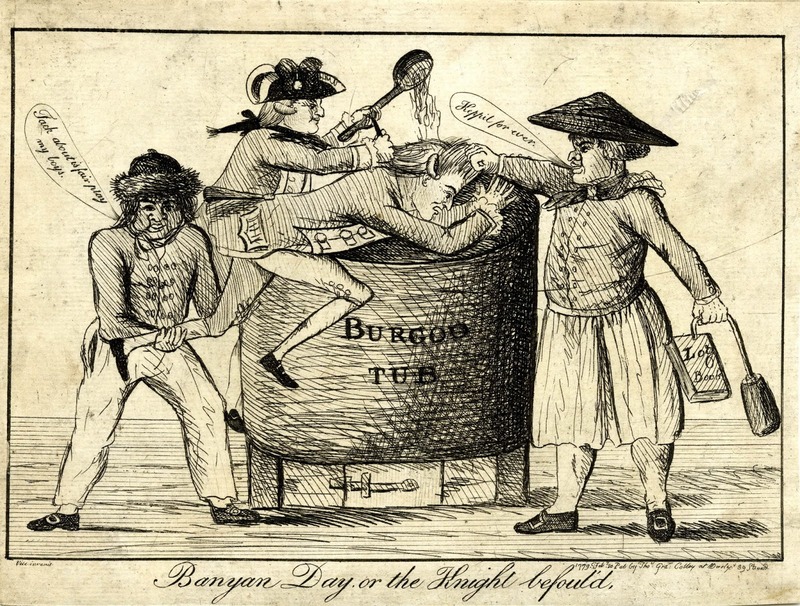 Published in February of 1779, this cartoon is weighing in strongly on behalf of Admiral Augustus Keppel at the height of the Keppel-Palliser Affair. You can read more about that event in this previous post on British Tars. The sailor on the far left wears what appears to be a Canadian cap, fringed along the brim with fur and topped with a ball of the same. His hair is pretty long, hanging over the shoulders. The jacket clasps with four buttons across, running all the way down the front. Side pockets are obvious on his white trousers. White stockings and pointed toe shoes with oval buckles complete his outfit. 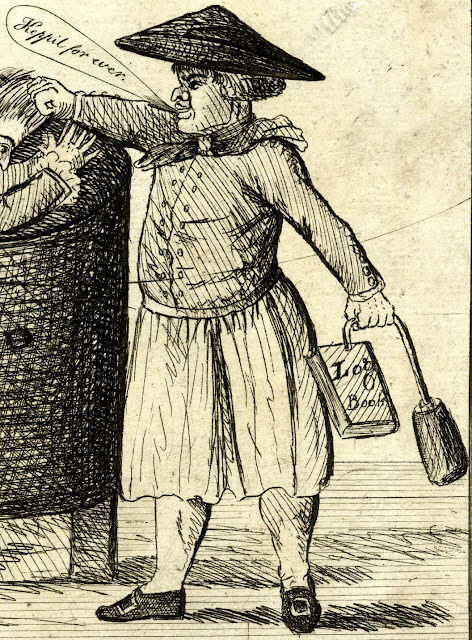 On the far right, grasping the gentleman by the hair and dunking him into the tub, another tar wears a cocked hat, and a black neckcloth. His jacket is double breasted with slash cuffs buttoned up. Hde wears a pretty typical pair of petticoat trousers that end just below the knee. Beyond that he wears white stockings, pointed toe shoes, and rectangular buckles. In his right hand he clasps a log book with a weight attached to it, perhaps an indication of cowardice on the part of Palliser.